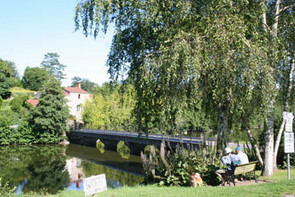 Getting to the Vendée has never been easier, so whether you are flying in, arriving by ferry, train or driving you will find the Vendée one of the easier destination to get to in France. Flying into the Vendée. Even though the Vendée doesn't have an International Airport of its own, it could not be easier to fly in. There is nowhere in the Vendée more than a hour away from an International airport with flights by low-cost airlines plus some regular scheduled airlines. For those flying from the UK see our page on flying to the Vendee for details of the various options. Ferries. For UK and Irish travellers there are a variety of options available for you, depending where you are starting your journey from. The nearest ferry terminals are at St Malo, Caen, Roscoff, Cherbourg and La Havre then you move east towards Calais. It is just 2 hours drive to the north of the Vendée from St Malo, whereas Calais is some 6 hours plus to the nearest point in the Vendée, so depending on your start point it may all come down to whether you prefer to do your driving in the UK or in France. Train. There is a twice daily TGV service from Paris Montparnasse to les Sables d'Olonne with one stop at La Roche-sur-Yon which takes less than 3 hours. For the south of the Vendée there are services that stop at Niort and La Rochelle. You can book a ticket to Fontenay-le-Comte. The train takes you to Niort with the journey from there to Fontenay-le-Comte station being by coach. Normal train services are also available though there are few stations in the Vendée. Driving. By far the largest proportion of visitors choose to drive to the Vendée and you will find the road system here good quality. Auto Routes. 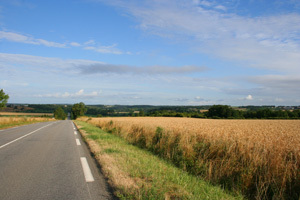 (Motorways) The A83 is the major auto route in the Vendée running from south of Nantes to Niort where it joins the A10 from Paris to Bordeaux. 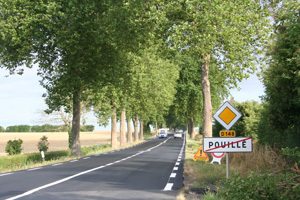 The A87 from Angers to La Roche-sur-yon crosses the A83, and after la Roche-sur-Yon it joins the D160 to continue on to Les Sables d'Olonne. All of the auto routes in the Vendée are 'Peage' (pay) and the cost is approximately 10 cents a kilometre. The "N" (National) and "D" (department) roads are of excellent quality although during the peak season you can expect delays at a few bottlenecks.